We give our utmost respect and gratitude to the Aboriginal people. We acknowledge the many struggles they have faced, and the challenges they are still fighting to overcome. We admire their resilience and survival skills, and their innate understanding of the universe that connects us all. 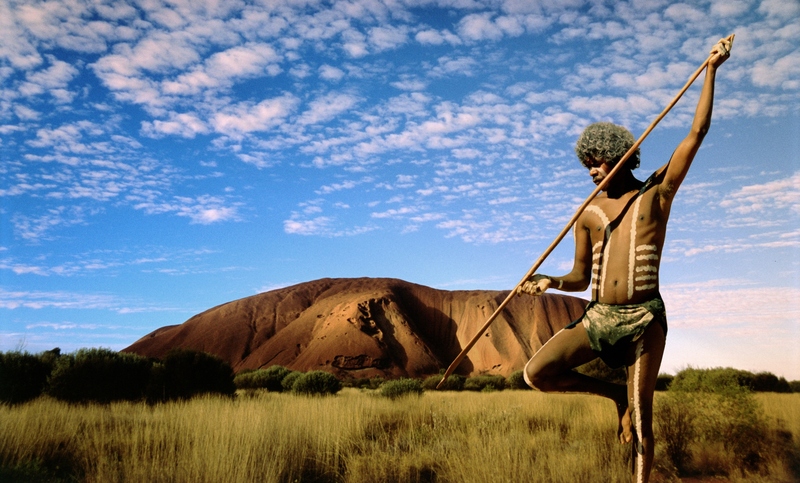 The Aboriginal people (indigenous Australians) have one of the longest continuously existing cultures on earth. Many scientists believe the ancestors of present-day Aboriginal people first arrived in Australia from Southeast Asia about 50,000 years ago. They have been making and playing didgeridoos (also known as yidakis in some areas) for at least 1,500 years, and are the original custodians of this sacred instrument. Indigenous Australians are physically and spiritually connected with their environment, and all the creatures in those habitats. 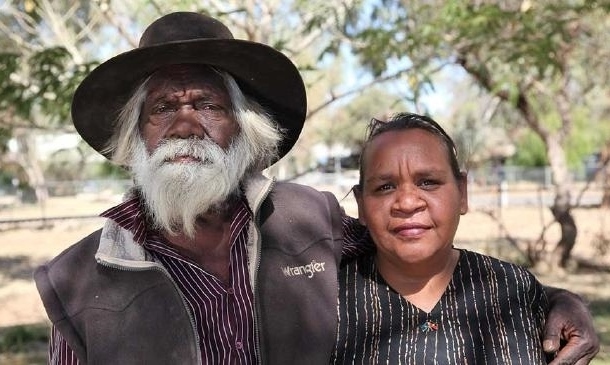 A common Aboriginal expression is “The land is my mother.” They believe spirit ancestors at the beginning of time created the world, all its creatures and the Aboriginal way of life, and that everything, past and present, is related. “Dreamtime” or “Dreamings” are legends that tell of the experiences of the creation ancestors. Aboriginal languages were traditionally unwritten. Therefore, painting, music, songs and ceremonies became – and remain – an important means of communication, by which to pass on traditions, laws and other information. 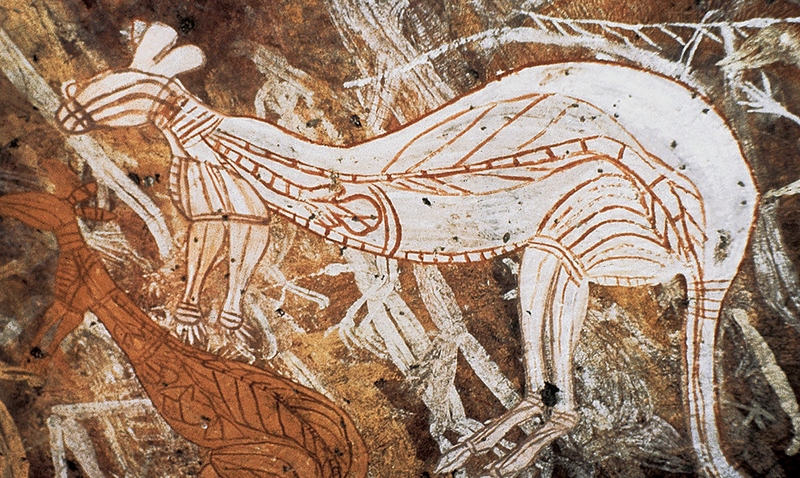 They have the world’s longest continuing art tradition, which began as rock art at least 28,000 years ago. Most of the 100 or so remaining Aboriginal languages are now written, and their main language is English. The didgeridoo has been played for at least 1,500 years, and is mostly associated with the Aboriginal tribes of Arnhem Land in Northern Australia. Since then, the didge has spread among many Aboriginal tribes, and around the world. 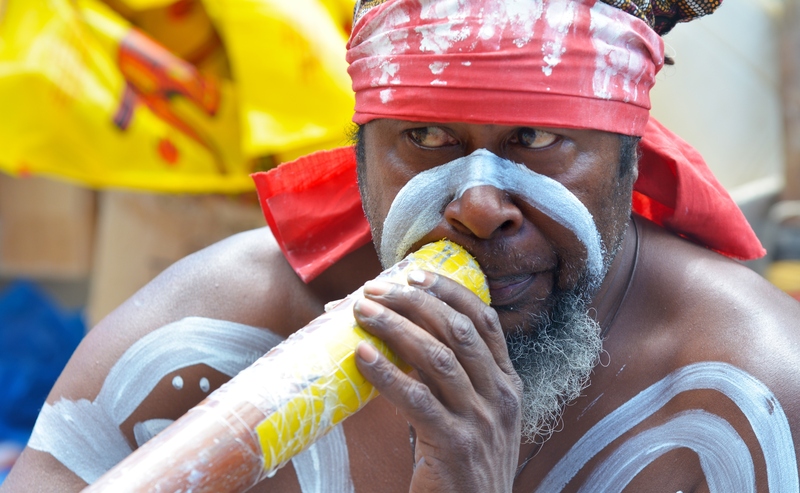 In Aboriginal culture, the didgeridoo is used in both ceremonies and informal settings, often as an accompaniment to chanting, singing and dancing. The music of traditional didgeridoo players is deeply related to the earth and their spirituality. The sounds of the instrument mimic sounds of the earth – of animals, humans and nature – and are filled with deep cultural meaning. Great Britain began colonizing in Australia in 1788, when at least 1,500 people (including about 780 convicts) landed near present-day Sydney. Aboriginal people soon began experiencing many cultural challenges, indignities and atrocities at the hands of the settlers, including racism, oppression, segregation, decimation, genocide, and loss of their sacred land. Ever since, they have suffered disproportionately high rates of depression, illiteracy, poverty, alcoholism, drug abuse and suicide. Even today, an Aboriginal person’s life expectancy is about a decade less than that of a non-indigenous Australian! Aboriginal people, who today make up about 3 percent of Australia’s population, became Australian citizens in 1947. Yet they didn’t gain equal voting rights throughout the land until 1965, when Queensland became the last Aussie state to pass equal suffrage laws. And it wasn’t until 1992 that the Australia High Court first recognized native land title in Australia. The Aboriginal people have their own distinct flag (top of page), created by Aboriginal artist Harold Thomas in 1971. The flag is designed with a black top half to represent the Aboriginal people; a red bottom half to represent the earth and the Aboriginals’ spiritual relationship to the land; and a yellow sun in the middle, symbolizing the giver of life. We believe that the Aboriginal people can teach us all how to better live in harmony with the environment and all of its creatures, and just as importantly, how to live in harmony with ourselves. We annually donate to many charities. Some of our favorite non-profit organizations are listed below. We especially recommend supporting the Aboriginal charities (designated with **), all of which directly help indigenous communities. ** Australians for Native Title and Reconciliation – Engaging, educating and advocating for justice, rights and respect for Australia’s First Peoples. ** Indigenous Literacy Found – Making a positive difference in the lives of Australian indigenous children by helping to improve their literacy levels. ** Madalah – Empowering indigenous youth to achieve excellence in life through education, by making a difference, and looking ahead. ** Yothu Yindi Foundation – Working for Yolngu and other Indigenous Australians to have the same level of wellbeing and life opportunities as non-Indigenous Australians. Center for Biological Diversity – Working to secure a future for all species hovering on the brink of extinction. Defenders of Wildlife – Working to protect and restore America’s native wildlife, safeguard habitat, resolve conflicts, and educate and mobilize the public. Fauna & Flora International – Acting to conserve threatened species and ecosystems worldwide. Oceana – Protecting and restoring the world’s oceans on a global scale. Rainforest Action Network – Campaigning for the forests, their inhabitants and natural systems through education, grassroots organizing and non-violent direct action. Wildlife Warriors Worldwide – Supporting the protection of injured, threatened or endangered wildlife; founded by Steve “Crocodile Hunter” & Terri Irwin.